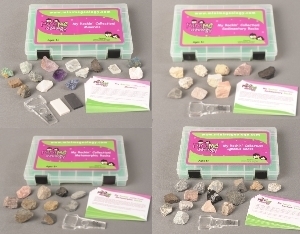 Save $10 when you purchase a full set of Mini Me Geology's My Rockin' Collections. You'll receive the Mineral Kit, the Igneous Rock Kit, the Metamorphic Rock Kit, the Sedimentary Rock Kit. Try to identify each mineral using the included identification accessories. If you need a hint, the name of each sample is beneath the foam padding. Best for ages 6 to adult.